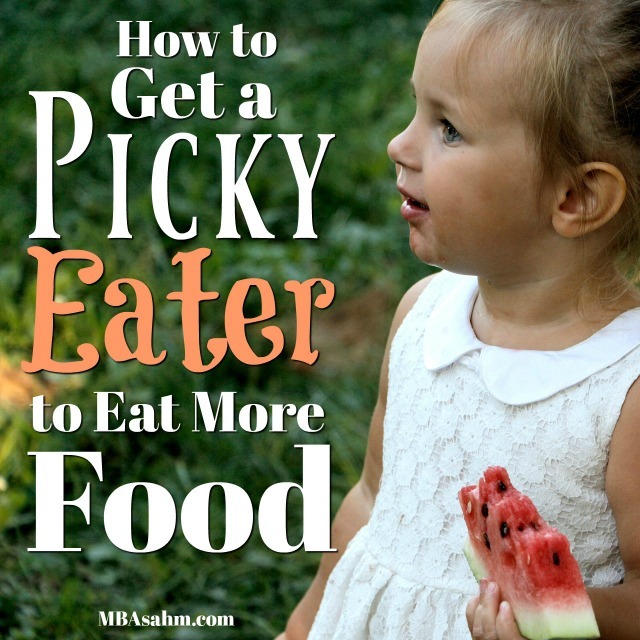 With picky eaters, there’s a natural tendency to try and convince them to eat something completely new and different. After all, many of them seem to refuse entire food groups! But for most of us, we’re setting ourselves up for failure. They’re picky. Something completely new is scary, gross, and just not going to happen. Instead, try to start with slight variations of foods they’re already eating. This will feel like a tiny step, but you won’t believe what kind of doors it opens. Eventually these tiny steps will become a big win. For example, for the longest time my son would consume two very specific kinds of squeezables as part of his short list of I’ll-eat-this foods. So in my mind, I checked squeezables off the list and never really tried pushing for others. What’s the point? He’s already eating two. So I just focused on trying to introduce new foods (which, by the way, never worked) and made sure to stockpile his two favorites. After one very frustrating day of failed food introductions, it occurred to me that maybe I just need to try something easier – a small win…for both of us. So I took him to the grocery store and said “Ok, we’re going to try and pick out one new squeezable. Let’s just see if any look good.” After a few minutes of examining every single squeezable, he decided that he might actually be able to try one…after all, cookie monster was pictured on it. The moral of this story?? Kids eat with their minds as much as their mouths! And while my son is still a picky eater, I was able to add peaches and strawberries to his diet. This tried-and-true method of nutrient introduction is a classic for a reason – it works. 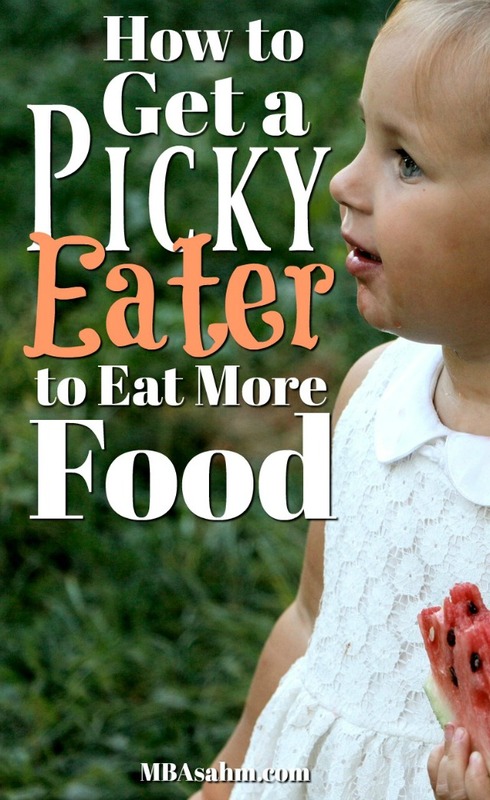 Again, it may not feel like a huge win because you’re still enabling a picky eater to be picky. But you’re getting more nutrients in them, which means you can sleep at night. The easiest foods to hide things in are ones that are homemade, so start with those. If your child won’t eat homemade food, don’t worry, you still might be able to be sneaky. Muffins, smoothies, and mashed potatoes are three of the easiest recipes to work with, but you could also extend this to desserts like cookies or ice cream (obviously you don’t want to increase their cookie intake, but if they’re already eating them, it may make you feel better to at least know there’s some added nutrition in them!). When you’re deciding what to add, don’t jump straight for the spinach or broccoli. Those are great, but there are other sneakier things to add that might not taste as strong and will be just as nutritious. Nuts and seeds are easy, tasty, and small, which means you don’t have to add too much to have an impact. Flax seed – Not only is this really nutritious, but it comes in a flour-type consistency, so it won’t add a crunch to the food. Hemp seed – This is another superfood seed that has a smooth consistency when it’s blended. Avocado – These can be easily added to baked goods and/or smoothies. Carrots – You wouldn’t think carrots could be sneaky, but they’re actually really sweet. The trick is to shred them, blend them, and/or boil them to make them soft. They can go great in baked goods or sauces like marinara. Sweet potatoes – When you boil and then mash sweet potatoes, they can easily slip into baked goods. You eat with your eyes first! For kids, this is even more true than for adults. I know we’ve all seen the crazy Pinterest creations of spectacular snacks that look like Disney princesses and heroes. If you can do that, great. If you can’t, then you’re with me. But don’t worry, there’s still hope for us…in the form of cookie sandwich cutters. I can’t take the credit for this one because my mom did the leg work, but lo and behold one day she presented my son with Choo Choo Cheese – aka grilled cheese – in the shape of a train. After that, he was a regular grilled cheese eater. I know grilled cheese is not high on the list of nutritional things to eat, but if you’ve got a picky eater, then you know nutrition isn’t the only battle. You need to be able to send your child off to school with a sandwich! You want to fill their little bellies! So for us, Choo Choo Cheese was a huge success! Guess what. Sometimes we just need to lie to our kids. But I promise you, you will only feel bad until it works…then, you will lie about everything. So try calling their food something else. Will they eat milkshakes, but not smoothies? Cupcakes, but not muffins? Mashed potatoes, but not cauliflower? There’s no reason you can’t call your son’s zucchini fritter a pancake…especially if that means they’ll eat it. For us, chocolate hummus (can you believe they make this stuff??) became chocolate ice cream. It pretty much looked the same, so he went for it. It doesn’t taste exactly like ice cream, but it was still good…and you know what? He loved it. So I kept feeding it to him and then slowly I started calling it chocolate ice cream hummus and then eventually I dropped off the “ice cream” and just started calling it by it’s real name – chocolate hummus. It’s not a massive win because there’s still sugar in it, but the top ingredient is chickpeas – so I’ll take it! Choo Choo Cheese wasn’t a success only because of the train cutter. It was also served by Grandma, which made it even better. For some reason, a lot of kids are way more likely to eat (or at least try something new) when someone else serves them. They know you too well! Not only that, but other people may have a different approach that you haven’t thought of. So whenever you have the opportunity, see if someone else can successfully get them to try something new. If you’re typically the one to serve food, you can even just switch to your spouse periodically. When other kids are eating something, all of a sudden it becomes way more desireable. So take advantage of that and see if your kid will join their friends for snack or lunch time! This lunch box was a total game changer for us. It was purchased, not surprisingly, for preschool lunches, but my son loved it so much that he started asking for dinner in it too. At first, I felt a little weird serving his dinner in his lunch box. Then I realized that he was more likely to eat what I served him when I used it. By using the lunch box, I’m able to sneak in healthier things or variations and he doesn’t even seem to notice. The lunchbox at dinner may be weird…but it’s certainly here to stay in our house! There are tons of different vitamins out there and many are made to look and taste just like candy. So go with my earlier tip – lie to them – and try to get them in the habit of taking a daily vitamin. This is good for the obvious reasons, but more importantly – it will give you peace of mind. Knowing that every nutrient has at least been ingested by your child is a massive weight off of your shoulders. My son currently likes the Flintstones vitamins, so that’s what we use. There are also different varieties of gummy vitamins, so they may be good to try out too! Two things happen when you let your kid pick out their own food. First, they get an opportunity to be in control of a situation that they otherwise dislike. And they get to eat with their eyes and mind first! When they pick out their own food, they’ve already decided that they like the food, which puts it at a huge advantage. Second, you may be really surprised by what they choose! On a few occasions, my son has shocked me by picking a food that he saw a TV character eat or a friend at school. You don’t know what you don’t know…so see what happens if you let them pick something out! For some kids, using rewards works like a charm. If this is your kid, then USE REWARDS. Obviously they can’t expect a reward every time they eat a vegetable, but sometimes just getting past the first taste is all you need. During our eat-more-food adventure, I ordered a few exciting toys that I displayed high up in the kitchen (so he could see them but not reach them). I made it clear what they were for and that he had to try something new if he wanted them. It took a day, but he finally agree to eat a blueberry (yes…this is how picky he is…). He actually put it in his mouth, chewed it up….and then spit it out. He got his toy because he did, in fact, try the new food. But that was the last blueberry I ever got him to try, so the reward system lost steam quickly. Moral of this story? Rewards can be tricky, but they are a classic for a reason – a lot of kids will respond to them! I hope at least one of these tips proves to be helpful on your child-feeding endeavor! I know how tough it can be, so good luck! Let me know what else may work in the comments section. Good luck! !